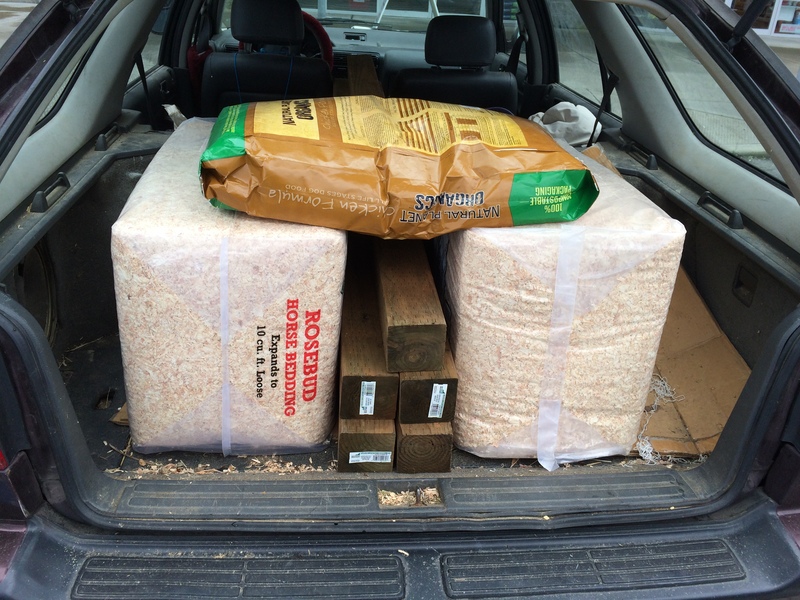 My body was refusing to do more manual labor today, so we headed out to get a supply of animal feed. Look who had run away. 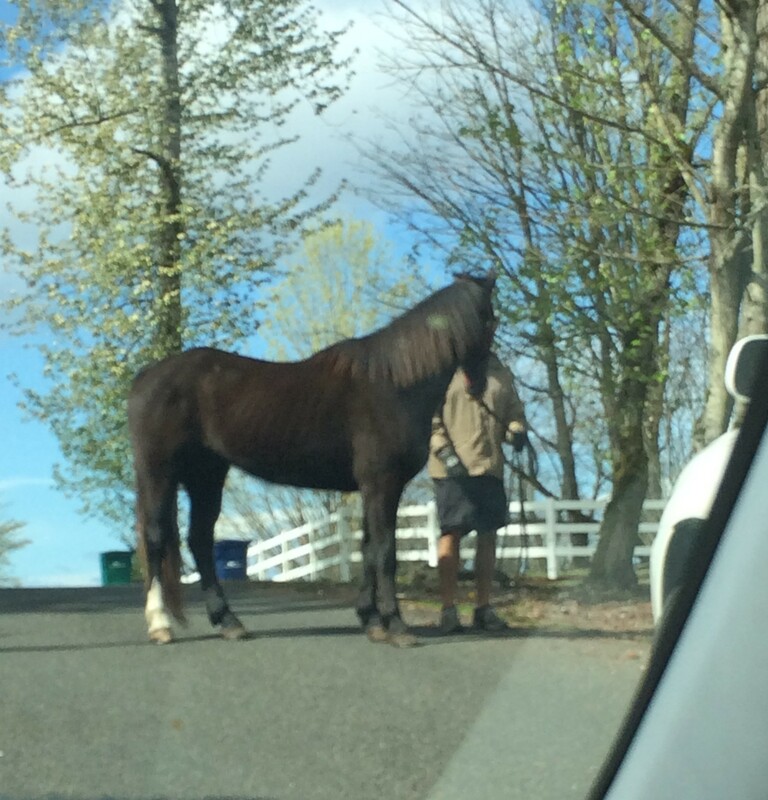 I don’t know who he is or where he lives, but he is quite away from home as he doesn’t live in our area. The truck on the right is following them so cars don’t sneak up on him. Grain purchased and in the proper containers, it was time to make lunch. After lunch was a good time to go into Seattle, which was more than a 3 hour round trip. We went to REI as I purchased a red jacket there which was great in every way except color. The more I looked at it, the more I realized I wouldn’t be wearing it as I wear mostly red and pink shirts and would feel like the colors were clashing. And DH had a jacket that he wanted to trade for one with a hood. They didn’t have any blue ones in the store, but will be mailing me one next week, which is fine. 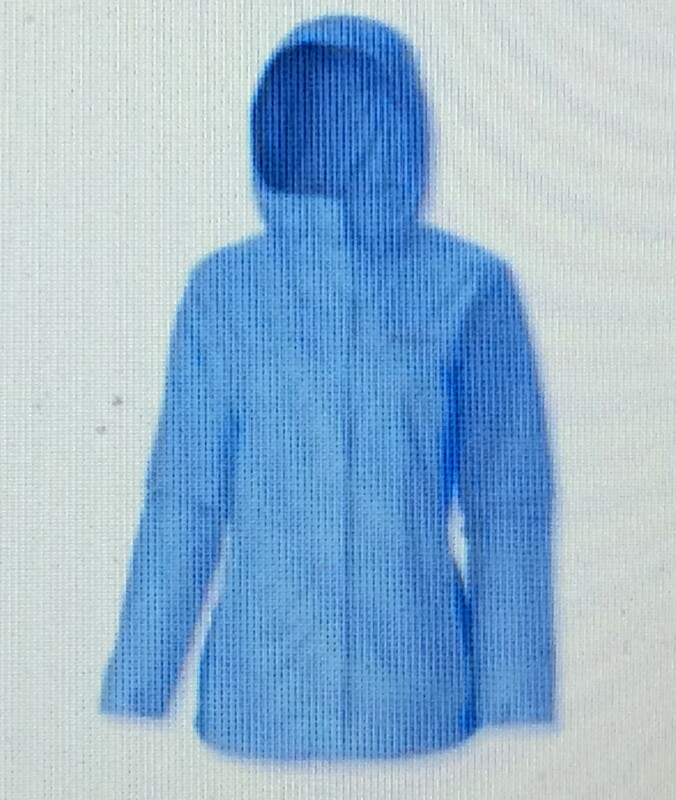 It is a type of shell, so more rain and wind proof than warm, which is what I need. After all of that running around, I took two hours to finish this scrappy top. Animals are now fed and put to bed, so I’m taking some time to help my brother on the family genealogy. If you’ve never worked on one of these, you have no idea how much time and effort goes into it. He has spent the last two years rounding up photos, flying to where the oldest people are that still might have information etc. With all this work, you did up a lot of interesting stories and get to know your ancestors. Hopefully he will publish this in the summer. 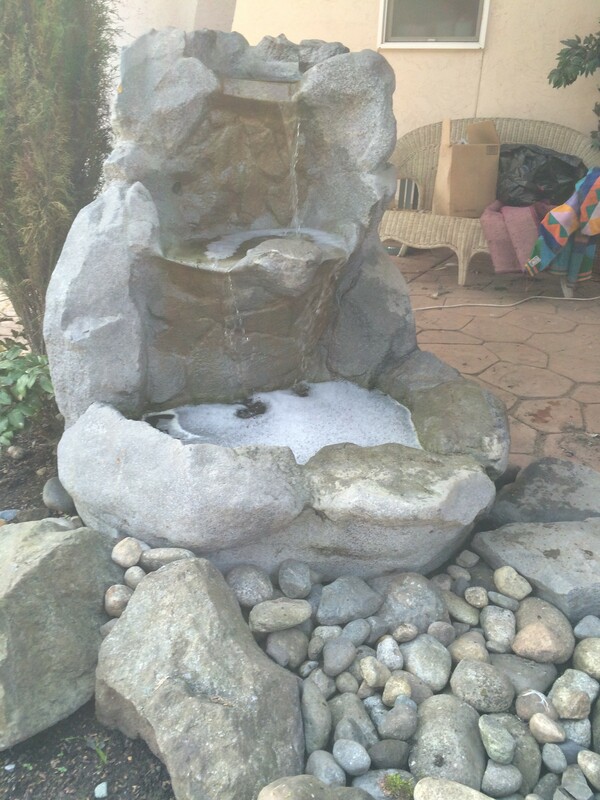 The fountain is once again working – for how long, we can only guess. But it’s fun while it works. 14 apple trees and 4 small nut trees. Since I was poorly advised last fall that hay would work just like straw as a mulch, we are having to pull out the hay that wanted to take root. 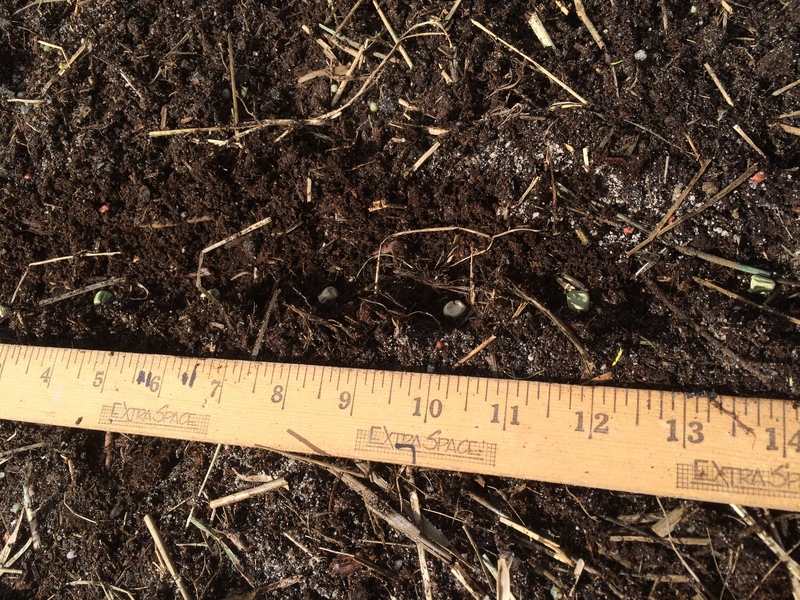 So pull it out we did, then added our fertilizers and planted a double 7 foot row of snow peas. I was going to put beets in as well, until I found I had no beet seed. 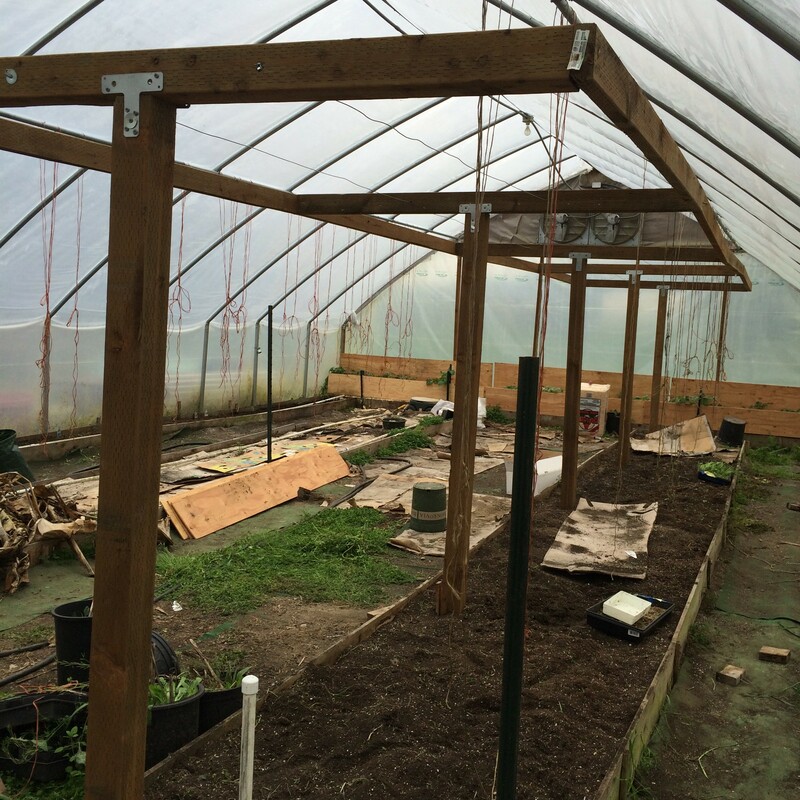 Tomorrow is calling for rain, so I will work in the hoop house. I have that 4 x 32′ bed that needs to be moved and Rome wasn’t built in a day either. However, coming past these beautiful blooming flowers as I enter the house refreshes my soul. 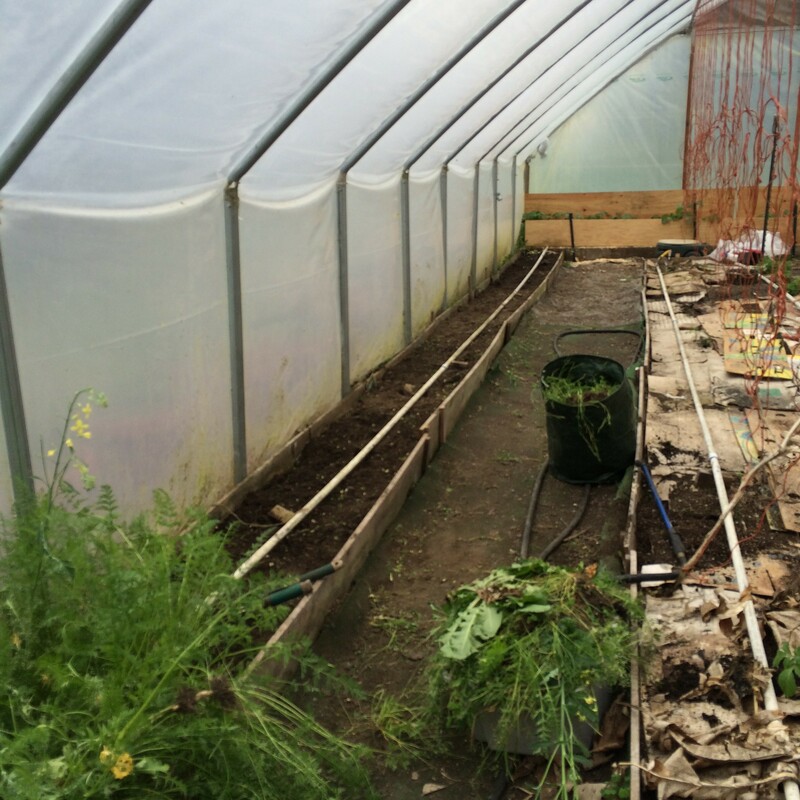 This is what greeted us in the hoop house this morning – beds of weeds to get ready to plant. I’ve neglected it for sewing and knitting. 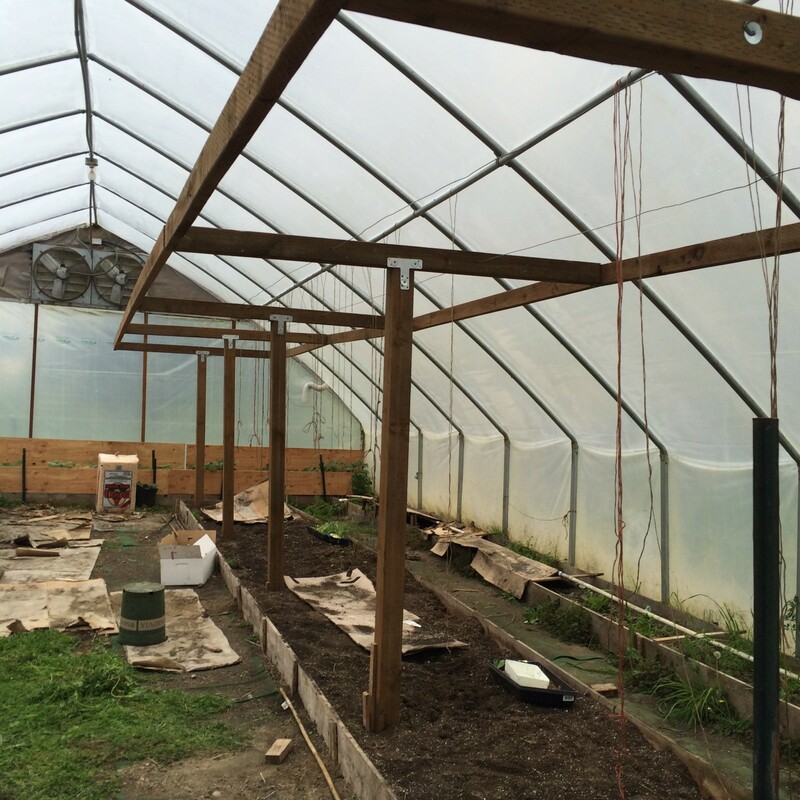 So I hired a young man to make this tomato cage for us. As you can see from the first photo, we need to move the box over 2 feet. We’ve had the box in about 3 or 4 years, but hadn’t counted on the overhang. It will totally shade the little box on the side if we leave it here. So it will get moved in the next week and if I’m truly lucky, the water will be put in as well. While he worked on that, we tackled the weeds. This is the south side and we will add the pre plant and fertilizer tomorrow, wet it down and plant it. I am so anxious to get some lettuce, kale and other greens in here. Last time I went to the grocery store, organic romaine lettuce was $4.00 a head and leaf lettuce was $3.00! So I’m going to try to keep it growing year round. I can, if I pay attention to planting times. The beets, onions, and carrots can go in here now as well. I just need to do succession planting so the foods are always available. Oh, yes, I also need to remove weeds from the hillside garden to get the peas in. Well, unless it rains this week – But then with a hoop house, it doesn’t rain, so we’ll see how much gets done before I promise more fiber time. Tired of the park yet? I hope not. It was really windy today, but look, there are fields of dandelions. 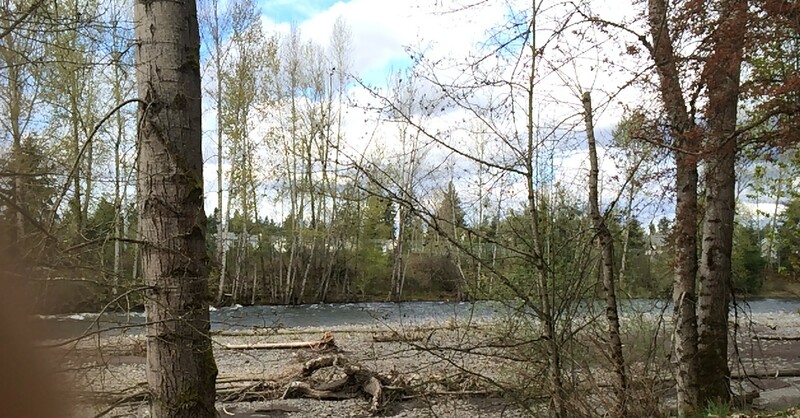 And finally, a better view of the river that runs along side of the park. 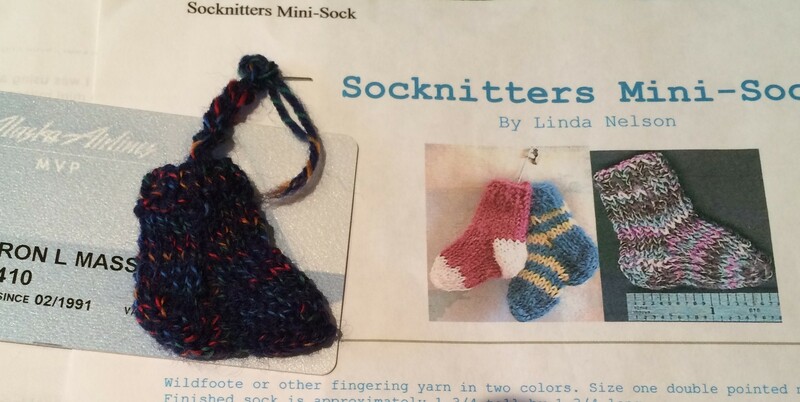 This tiny sock was done on size 1 needles with left over sock yarn. I think when I make it again, I will add rows to the foot. It looks stubby to me. The mini mitten turn out pretty good, I think. I’ll make another and use it as an ornament. that is a credit card size card that it is laying on. This quilt has been finished, washed and dried. The washing was because I tried pasting and pressing the binding down before sewing it. I liked the ease of sewing it then, but some of the glue did get on the fabric. Fortunately Elmer does wash out. I was a bit leery because not all the fabric had been pre washed. But it washed and dried very good. It is lying on the coffee table as it was still a bit damp. 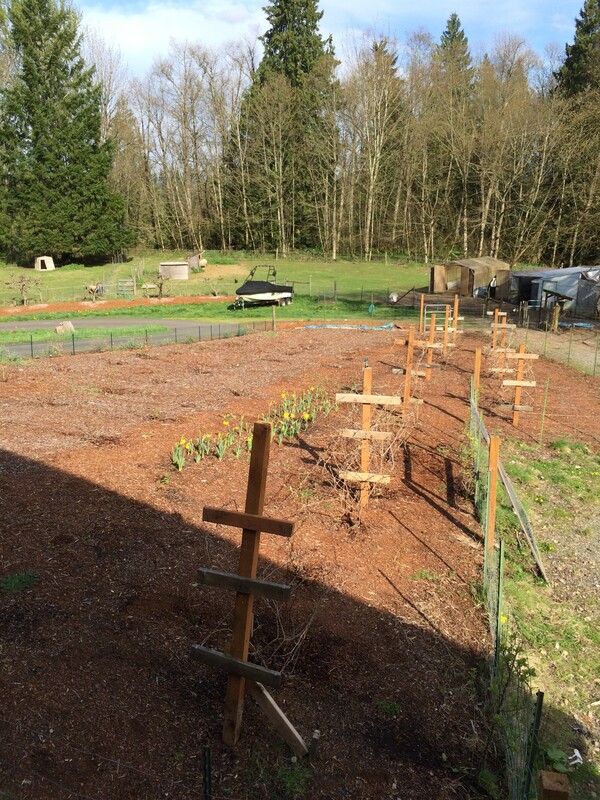 We mixed pre plant fertilizer and our growing fertilizer so we are all ready to plant the peas on Sunday, after removing weeds. Hopefully, we’ll have enough energy left over to get some onions and greens in the ground as well. Here’s wishing each of you a great weekend. 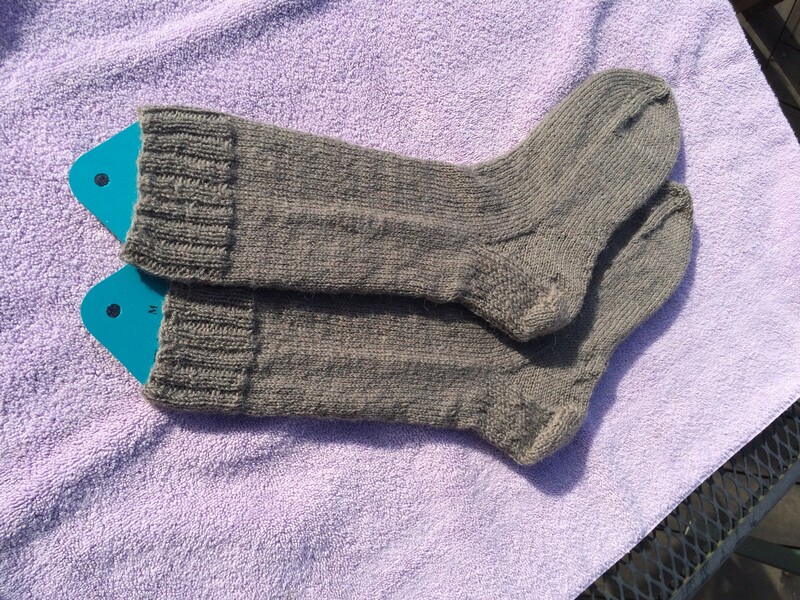 I’ve made for him, so I’m not in such a hurry to make the next pair. But I do think they will be just like these, so that if he wears out a sock from each pair, he will still have a pair left. What forethought!. I have knit with a lot of yarn that I enjoyed more. This yarn was very soft and I enjoyed the feel, but it wanted to split and it also showed any unevenness in knitting. 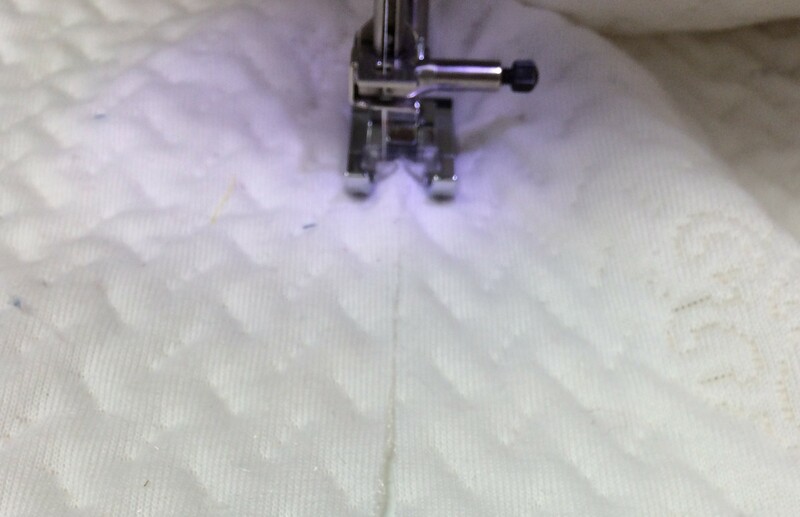 So every time I looked up or something slipped off the needle, it showed as unevenness. But they are a good wearable pair with a 10 year guarantee on the yarn. That will be interesting. 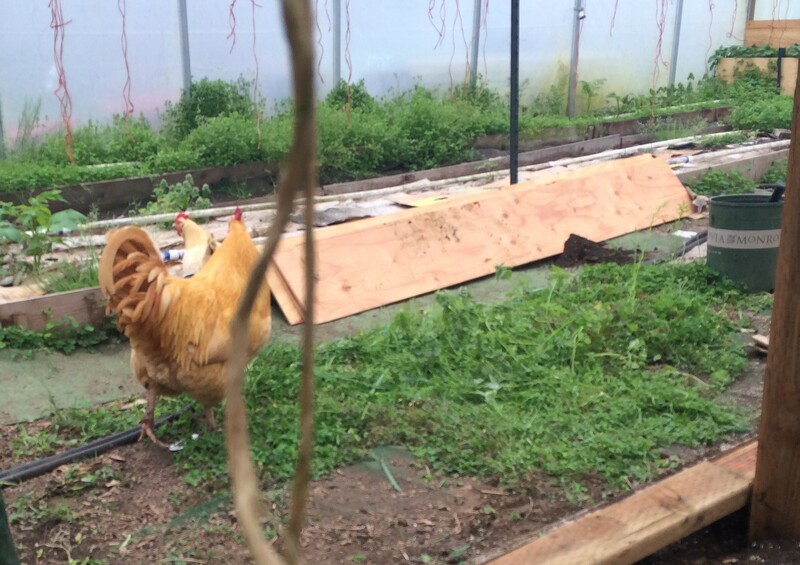 Now for excitement – when I put the animals to bed at night, I usually leave the main gate open just enough for the chickens and turkey to get in. Apparently, tonight, it was a bit too much. I spent about 15 minutes chasing alpacas before calling for reinforcements. It’s really too bad, because if they weren’t so difficult to get back inside the gate, they could come out and eat all the grass we have to mow. Perhaps tomorrow, we’ll try letting them out in the morning and putting them back at noon, when they usually have their rest. Keep your fingers crossed, they’ll go back peacefully. If they do, we’ll all be happier. 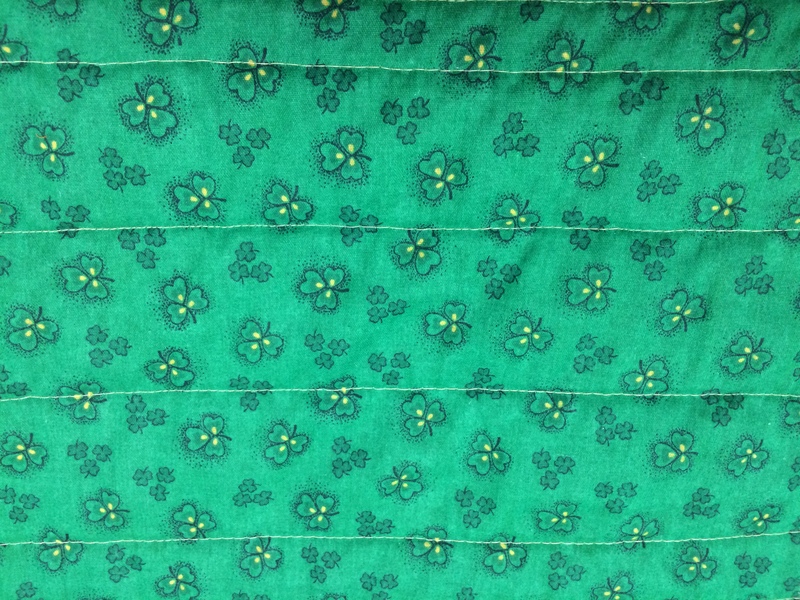 Today, I decided to see how it would go if I could sew and quilt the strips at one time. 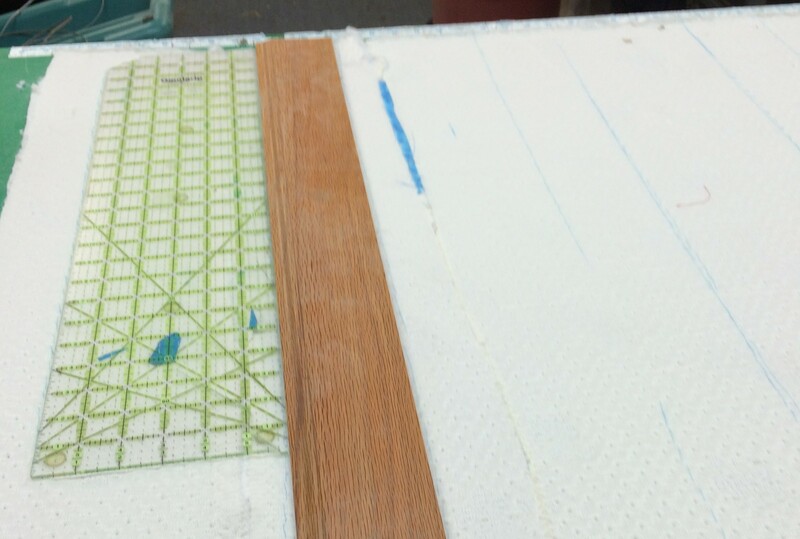 Using left over heavy batting I pieced it with a wide zigzag to make a section 44 x 54″. Then I took some of my cut strips from days past that were the full width of the fabric. If they weren’t, but there was more than one piece, I pieced them to get the width I wanted. I laid out the backing and sprayed it. Then put the batting on top of it and marked it so I’d have some type of guide. The first piece was put right side up on one edge and the second on top of that piece, but upside down. Each piece had to be pressed before the next one was added. I continued in that way until I had enough pieces to cover the batting. Even with having marked the batting, I had trouble keeping straight rows. I’m not sure how much the heavy batting had to do with that and how much was just me. Now that the rows are together, I squared it up and it is ready for binding. All finished in one day. But I think I would rather spend a day sewing rows together for 2 or more quilts and then spend the time quilting them. I think it would be faster and neater. However, I do have another quilt nearly finished. at 42 x 51″. DH likes me to go with him when possible. So today was a shopping day – meaning mostly we needed to get posts and such to put up the tomato T-posts. We brought a load of 4 x 4s home which are sitting in my spot in the garage and went back and purchased 5 more (he insists we don’t need a truck). 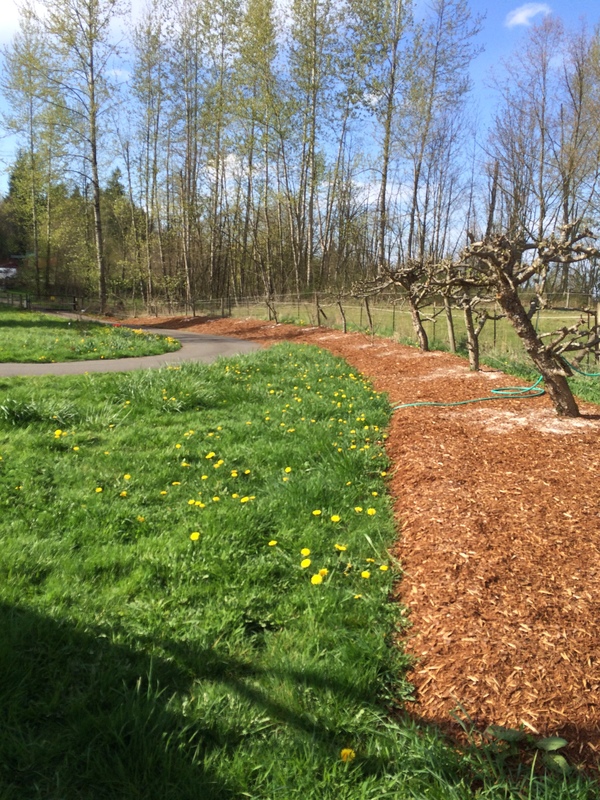 From there, we needed shavings to put around the potatoes, because dirt will be too heavy for where they are. I will have to get more tomorrow as my “truck” wouldn’t hold more and I need some for the chicken pen. Anyway, from there, we went to get dog kibble and then the grocery store for lettuce and tomatoes. I took along the socks I’ve been knitting for him and was able to stay in the car for all of this except the dog food and grocery store. So, I was able to get about 5″ done today. it would have been such a waste if I hadn’t had a project ready. Well, not really, I would have grabbed yarn for another dishcloth. But I was so happy to make so much headway on the socks today. If all goes as planned, we will have help putting up the tomato “stakes” Sunday and then I can show them to you. Our church has one day a month where they pass out sandwiches, clothing and blankets to the street people. They need more quilts and blankets. There seem to be a number of people with children who live in cars. So this morning, I took out some of those squares I cut out last week and started making a multi color quilt that won’t show dirt too rapidly. 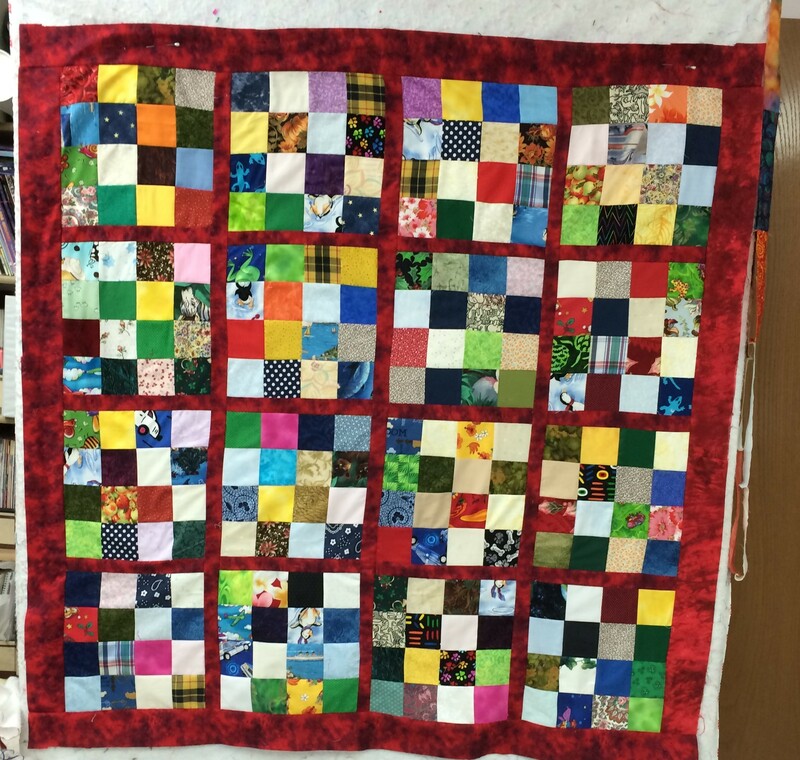 I have 3 weeks until our turn again, so will get busy and see if I can get 2 or 3 small and/or medium size quilts done by then. 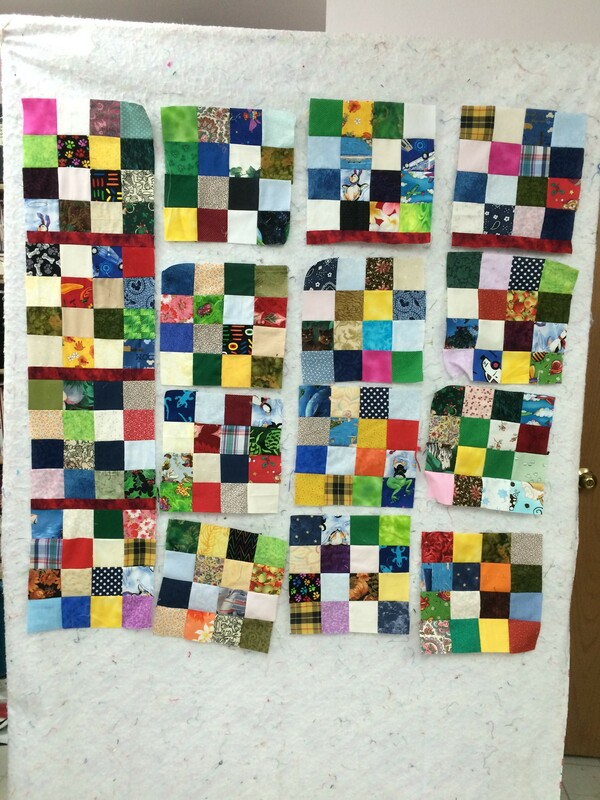 These are 3″ squares that make a 10″ finished square. 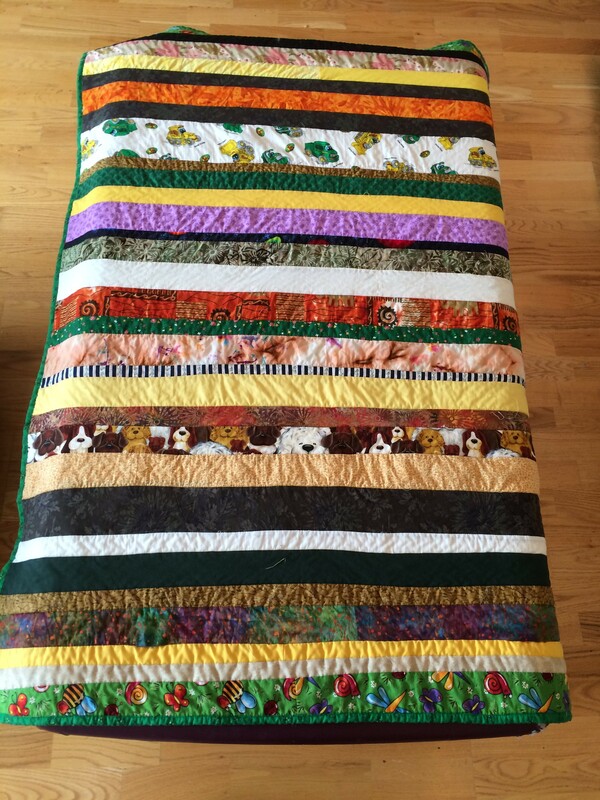 I made some strip quilts before which they really liked, so that is also a possibility. 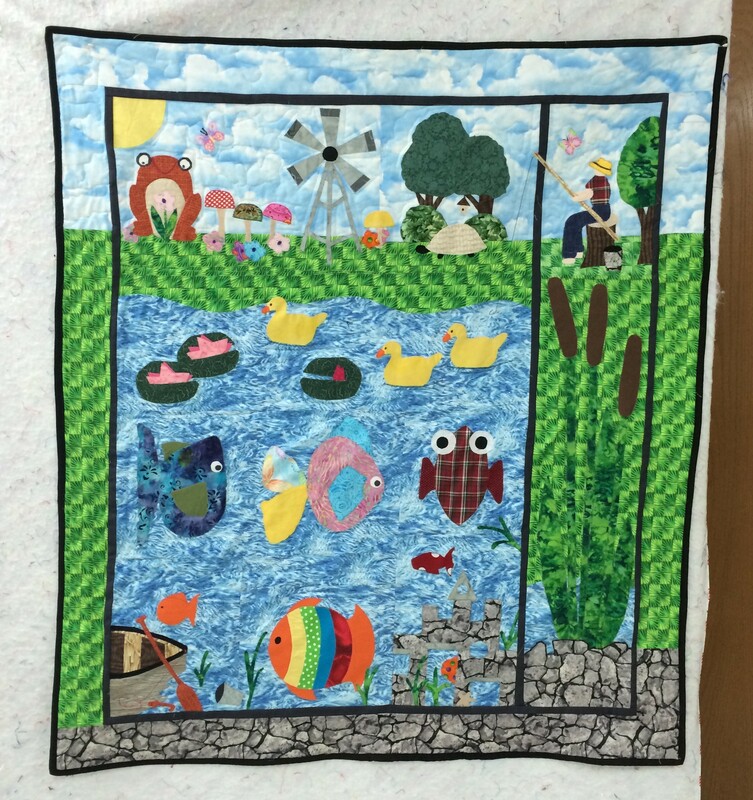 This quilt should was a block of the month last year by “Two sisters and a quilt”. I’m sure some cold child will be quite happy with it. It measures 40 x 45″. I’m happy as well because it is finished. I think I will stay away from raw edge applique as it’s not my favorite. However, if I started it, then I feel I have to finish it.